DavidsTea’s Jasmine Peony came to me in a resealable silver bag. When I opened the bag (and when I smelled this tea in store), the first thing that I smelled was the very strong aroma of jasmine. The tea leaves are long, lightly twisted – the variation in colours from cream to dark brown is very noticeable. It smells sweetly floral, just what I look for in a jasmine tea. Jasmine Peony consists of white tea from the Fujian Province, and is scented with jasmine flowers. You can definitely smell the jasmine, and I even spotted a petal or two from the jasmine flowers. DavidsTea recommends steeping Jasmine Peony in “hot” water for 4 to 7 minutes. Hot water is 75-80°C (167-176°F). I did an initial steep of Jasmine Peony for 2 minutes in 79°C (175°F). Jasmine Peony steeps to a pale yellow, this tea has a fragrant jasmine aroma to it. 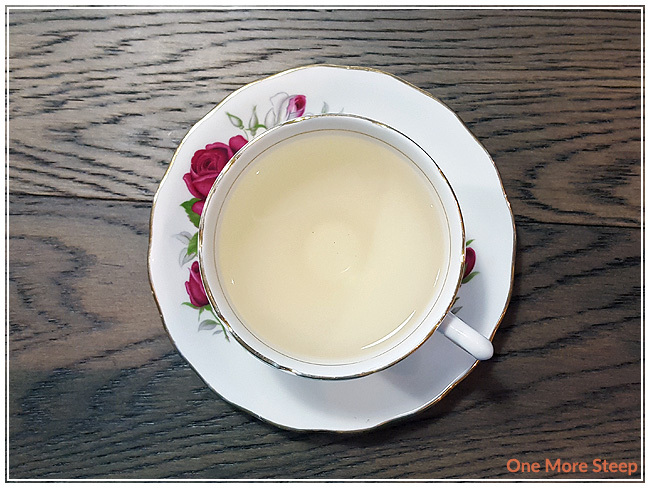 The flavour of this white tea is floral and sweet, with a nice smoothness to it with a light vanilla flavour. At the temperature and length of time I steeped it for, Jasmine Peony lacks bitterness and astringency. This tea has a nice mouthfeel to it, and the sweetness almost reminds me of honey. 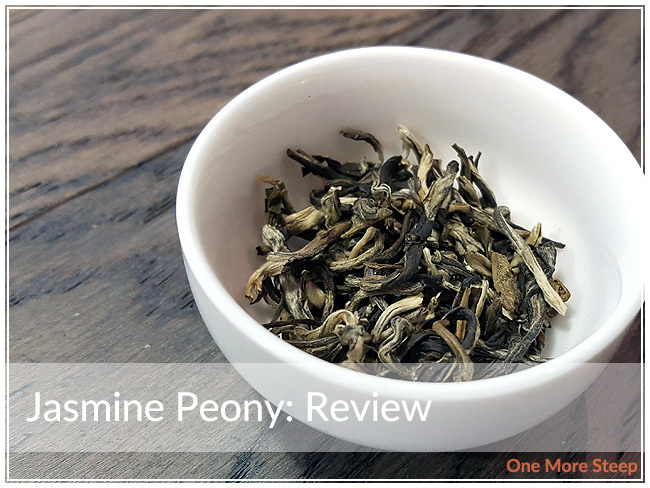 I resteeped Jasmine Peony four times (five times total), adding an extra 30 seconds for each subsequent steep. I found that the colour was most intense for the first resteep – becoming a deep golden yellow. 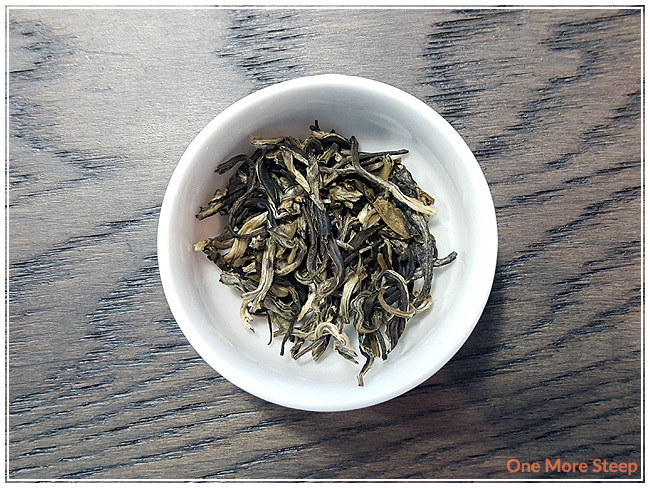 The flavours became stronger for the first resteep, I enjoyed the tea with each steep. 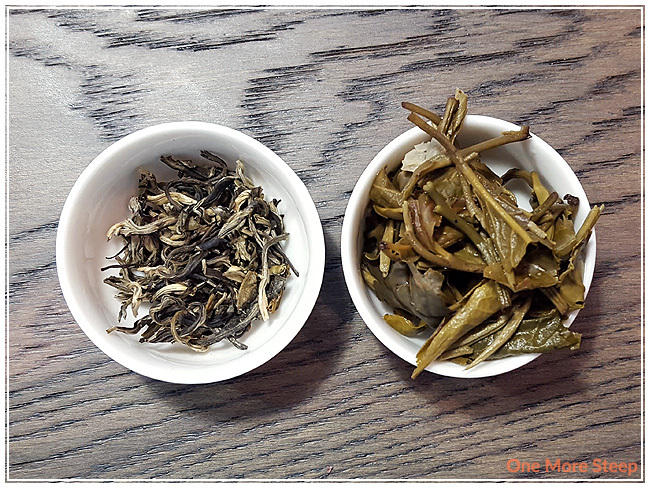 The flavours began to wane with each steep after the first resteep, and was still tasty to drink by the last steep. 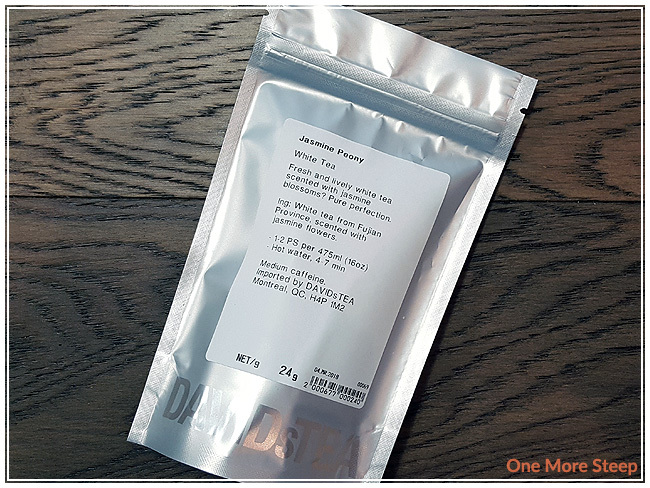 I loved DavidsTea’s Jasmine Peony. This was a really enjoyable white tea, I loved the aroma of the jasmine and the flavours that steeped from this white tea. The floral flavours are intense and it makes for a great cup of tea, especially if you’re a fan of floral notes. I think this tea would be a great option for afternoon tea because it’d play off of savouries and sweets quite well.